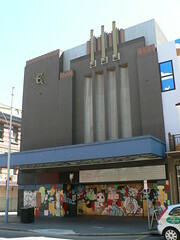 The Metro Cinema in Hindley St, Adelaide was designed by architect Thomas W Lamb and opened in October 1939. When I took this picture in 2005 I wasn't sure that the building was still in use. It looked like a nightclub but naturally there was no sign of life during the day when I was poking around. It certainly wasn't a cinema anymore. As you can see it had an interesting paint-job, highlighting the decoration on the facade. It wasn't too badly done but I find this totally unnecessary because it almost certainly designed as a monochrome building with the light and shadow bringing out the beauty of the decoration. This building doesn't look too bad but there are some shockers around where some of the Art Deco details have be picked out in a bright colour and frankly they just look cheap and tacky. I was back in Adelaide last weekend and the former Metro Cinema is no more. 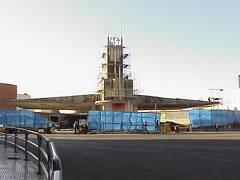 It has been demolished and another building is being constructed on the site. 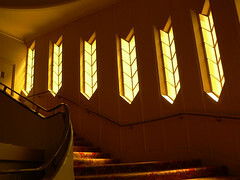 If you want to see the Metro Cinema in all its Art Deco glory have a look at the Cinema Treasures website. On a happy note. Happy 70th Birthday to the Sun Theatre, Yarraville which opened on 30th April 1938 with a screening of the film Maytime. 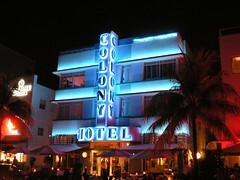 The Colony Hotel is one of the fabulous Art Deco hotels along Ocean Drive in Miami South Beach. It was designed by Henry Hohauser in 1935. 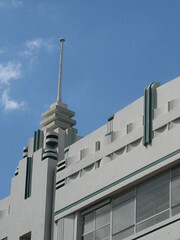 Hohauser designed many buildings in the South Beach precinct providing a significant contribution to the Deco heritage of the area. The building has simple decoration. 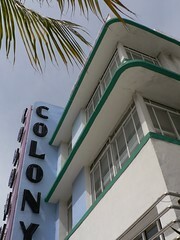 A large sign dominates the front of the building spelling out Colony Hotel in bold letters supported on an inverted ‘T’. There are several series of thin horizontal bands either side of the sign and short vertical bars along the central part of the roofline with a zig-zag pattern on either side. The windows form recessed horizontal bands with protruding eyebrows providing additional shade from the Florida sun. The eyebrows curve around the sides giving the building a nice profile from street level. The windows themselves cut through the corner of the hotel but there are also supporting columns giving the overall appearance of a continuous wall. At night the character of the whole area changes when the neon is lit. 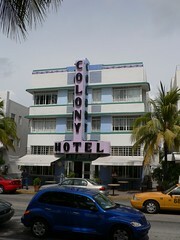 The Colony Hotel is no exception as you can see from the photo below. Last Friday saw the annual observance of Anzac Day around Australia and New Zealand. Anzac Day honours the men and women who died during war and is commemorated on the anniversary of the failed landing of the Australian and New Zealand Corps (ANZAC) on 25 Apr 1915 at Gallipoli, Turkey. I was in Dimboola, in western Victoria and decided to have a look at the local high school which was erected as a memorial to the soldiers from the town who had lost their lives during World War I. At the time most towns erected cenotaphs or halls to honour their war dead so Dimboola was quite progressive to build a high school. The building was designed by W McKay, the Chief Architect of the Public Works Department and work was completed during 1924 although the Soldiers’ Memorial Higher Elementary School wasn’t officially opened until 2 Dec 1924 followed by a public banquet that evening. A WWI honour board was erected on the front of the main hall and other boards have been added for WWII and other conflicts since. 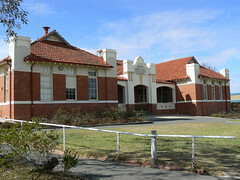 The school was renamed Dimboola Memorial High School in 1947. I don’t think the building is particularly Art Deco but the fact that it was built shows how the First World War affected all areas of society not just those who lost family members and how something positive can come to a rural Australian town from such a terrible world-wide atrocity. 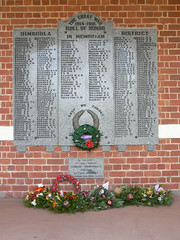 For a more detailed history of the school see Dimboola Memorial High School website. I love this doorway in Asmara. From memory it is from an apartment block in Maryam Gmbi St, but I could be wrong. 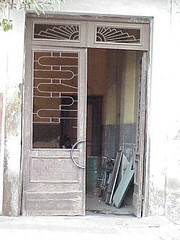 Anyway, I look at what is left of the door and it just screams Asmara Art Deco. The large semi-circular handle is just like the ones on the doors of the Cinema Impero in Liberation Avenue. They are perfect for a cinema, very grand for an apartment block. The metalwork in the top part of the door combines alternating curved sections with simple straight supports. Again there are similar examples of this elsewhere in Asmara. Finally, the sunburst pattern above the door is a common deco motif, used the world over. This is a great doorway. Sure, it needs a bit of work but imagine what it would look like with the metalwork repaired and the glass replaced. It would be sensational. 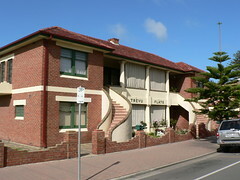 To be honest, the Trevu Flats in the Adelaide suburb of Glenelg is not the most spectacular building around, but what attracted my attention is the two staircases curving in the same direction. This configuration was probably forced onto the builder/architect because the block abuts the back of another property so there wasn’t the space to allow the staircases to go in opposite directions but it may well have been conceived that way in the first place. In any case I think it looks great and lifts the building to be something special. 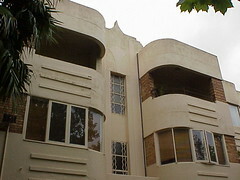 Besides the staircases, the Trevu Flats have several Art Deco features. The name of the building is spelt out in stylish lettering on the front of the building between the ground and first floor balconies. Those balconies are enclosed by matching canvas blinds which preserves the integrity of the original structure while providing shade and privacy for the residents. The flats are made of red brick with a horizontal cream band running around the building between the two floors. The lintels above the windows are similarly painted cream and work well against the green window frames. The tiled hip roof, for me, lets the building down. I feel it would be a more striking building with a flat roof. The garden is surrounded by a low stepped red brick wall which is mirrored in the small concrete balcony on the side of the building. Even now, looking at these photos, my eyes return to the steps. Whether they are an elegant solution to a physical limitation or a stylish flourish on the part of the designer, they are beautiful. According to a postcard reproduced in “Asheville: A Postcard History” by Sue Greenberg and Jan Kahn, the Citizen-Times Newspaper Building was designed by Anthony Lord with Lockwood Greene from New York as consulting architect. In 1930, The Citizen and The Times, two local newspapers, joined to form the Citizen-Times and the building probably dates from after this time. The building is a relatively plain moderne building, a three-storey asymmetrical grey structure. The decoration comes from the simple raised bands near the roofline, top and bottom of the windows and to the sides of the name above the entrance. The use of glass blocks to surround the conventional windows provides a nice visual contrast to the concrete facade. Glass blocks are also used as a vertical element in the square tower leading up to a flagpole projecting from the front of the building. 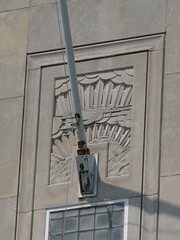 At the base of the flagpole there is a small relief panel depicting mountains in front of stylised sunburst and geometric clouds as if to prove that even plain buildings need some decoration. 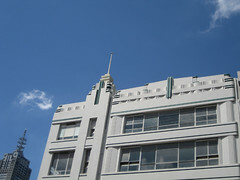 Lonsdale House is a fantastic moderne building in Lonsdale St, Melbourne. If you look carefully, however, you might be able to see that it is actually an update of two earlier buildings. 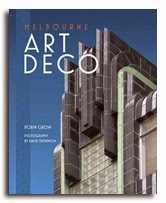 Architect, I G Anderson designed the renovation creating an asymmetrical building that has become an Art Deco icon of Melbourne. The most striking feature is the geometric tower, a pile of squares and discs supporting a flag pole. A vertical band of decoration partially running down the front of the tower mirrors a similar element on the centre of the parapet on the right hand side of the building. Viewed in isolation, this right side of the building can clearly be seen as a separate building with a symmetrical parapet. The discs on the corners are matched by the design of the left hand corner of the entire structure. Spandrels below each band of windows are used to unify the two previous buildings. The two lower bands on the left form balconies of differing sizes. The name, Lonsdale House, is rendered across one of the spandrels on the right hand side in stylised lettering. Myer are planning an extensive re-development of their Lonsdale Street store, which is next door to Lonsdale House. 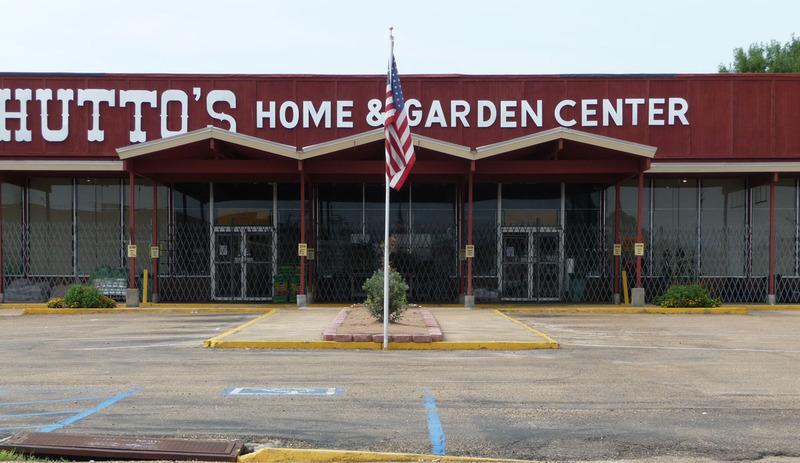 Their plans include the demolition of this wonderful building which they own. 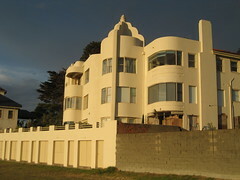 The Art Deco Society oppose the demolition and has nominated Lonsdale House to both Heritage Victoria and National trust for inclusion on their Registers. I hope that Myer can alter their proposal to retain this impressive building. It would be a shame to lose such a unique Melbourne building. Sometimes I get to a great Art Deco building and for some reason I can’t take a nice photo because the weather is bad or the sun is in the wrong place or there is something in the way. In the case of the Gas Company Building in Dublin it was a couple of double-decker buses. It was a busy time of day and there was so many buses coming and going that I never got a clear shot. Even so, this is a great building and there are lots of pictures of it on the FJP Dublin Photos page. The three storey building has a smooth black granite façade on the ground floor with large shop windows with two rows of smaller office windows on the floors above. A scalloped pattern decorates the façade just below the flat roofline. The single word “GAS” displayed above the door gives no doubt of the buildings purpose. Designed by Robinson & Keefe in the late 1920s or early 1930s this building was the showroom for the Gas Company servicing the Irish capital. The façade also has several stepped elements. The whole of the display windows and doors are stepped back into the building. There is a stepped ornament above the door and one is each of the alcoves on either side at street level. Even the small vents along the front of the building have been designed in the style of a sunburst. The building is now the School of Nursing and Midwifery Studies, Trinity College. Their site has a nice collection of photographs of the interior of the Gas Company Building. 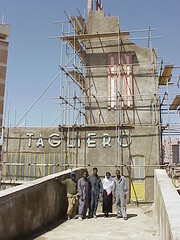 I was pleased to see that this article on www.eritreadaily.net included a picture of the fully restored Fiat Tagliero building in Asmara. 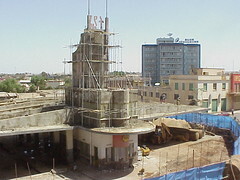 When I visited Asmara in April 2003, the building was surrounded by a blue temporary fence and covered in scaffolding. I was initially disappointed since this is one of Asmara’s most famous buildings and the one I most wanted to see. The building was designed by Italian architect Giuseppe Pettazzi and built in 1938 when Eritrea was a firmly established Italian colony. It might look like an aeroplane complete with glass cockpit and wings but it was and still is a Service Station. The huge cantilevered concrete wings have no supporting columns. They are reinforced from above by a series of concrete ribs but are otherwise unsupported. Denison, Yu Ren & Gebremedhin report in their wonderful book Asmara: Africa's Secret Modernist City that the architect Pettazzi had to include pillars propping up the wings as some people did not believe the structural soundness of the structure. The pillars were made of wood when the building was opened it is alleged that Pettazzi put a gun to the builder's head to force him to remove the pillars. The wings held and we have this wonderful structure. 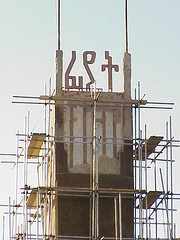 The lettering on top of the tower is Tigrinya local Eritrean languages. I love the shapes of the lettering but I have no clue what it says. I mentioned my initial disappointment of seeing the building surrounded by scaffolding but it worked to my advantage when our small group stuck our heads into the tower and seeing a spiral staircase we gestured that we might climb onto the wing. A simple nod was all it took for us to be up the staircase and out the narrow yellow door. The workers were a bit surprised to see us but posed for a photo. They thought we were mad to have travelled all the way from Australia to see a bunch of buildings. I’m not sure they aren’t correct but we established a bit of a rapport and they shouted a hasty warning if they were about to pour a fresh batch of concrete on us. 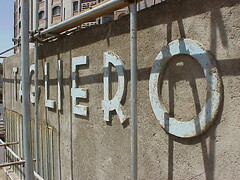 I walked up one of the concrete ribs to get this shot of the Tagliero lettering. It is one of my favourites even with the scaffolding and the shadows. I’m still shake my head when I see pictures of the Fiat Tagliero building when I think that I’ve walked on those wings. I can assure you that Guiseppe Pettazzi was correct with his structural engineering they feel as solid as a rock. After we had reluctantly come back down to earth both physically and metaphorically I noticed a man sitting at the window of a nearby building looking down at us laughing. I signalled could we come up to his office and take some pictures. He glanced around nervously before nodding. As I’ve said, we didn’t need much encouragement and quickly counted off the floors and headed for the lifts. We were greeted by the staff of the local office of the German company Siemens who invited us in. They thought we were mad until we showed them the pictures of Asmara in our Lonely Planet Guidebook and even then I think some of them were not too sure. But they took us out onto their terrace giving us perfect views of those amazing concrete wings. Sometimes I do think we were mad to go to Asmara but only for a split second because it was one of the best experiences of my life. The buildings were fabulous. The people were charming. The sun shone everyday we were there and you could get a pizza, a cappuccino or a beer on just about every corner. 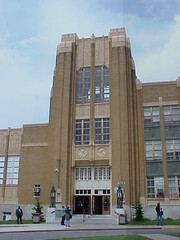 Will Rogers High School in Tulsa, Oklahoma is a fine example of Public Works Administration (PWA) Art Deco architecture. 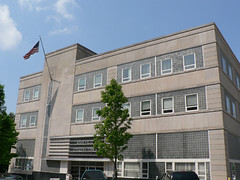 PWA was established under U.S. President Franklin D. Roosevelt to boost public building programs during the 1930s depression. 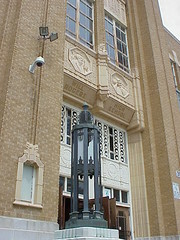 Architects Joseph R. Koberling jr, Leon B. Senter and A.M. Atkinson collaborated to design the Will Rogers High School which was opened in 1939. The school consists of a two storey brick building with two large square towers marking the entrances. There is a large amount of detailed decoration on the building facade. Under the classroom windows there are blue-grey panels with intricate decoration. Above the windows and the tops of the towers are decorated in a light pick colour. The decoration continues down the towers to the doorways which have two large black lamps standing on either side. The slightly more decorative tower has a white panel directly above the doors and then two octagonal medallions featuring Will Rogers, one in a cowboy scene and the other with a movie camera, plane and rodeo rider. “Will Rogers High School” is inscribed in gold below these medallions. The plainer of the towers has a simple row of windows directly above the doors with two similar octagonal medallions this time featuring representations of a male and female student. 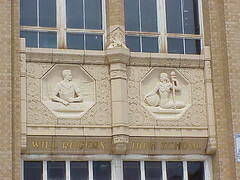 Will Rogers High School was one of the many highlights of the 6th World Congress on Art Deco hosted by the Tulsa Historical Society in 2001. Formerly the Heidelberg Town Hall and Municipal Offices, The Centre Ivanhoe now operates as a reception centre. 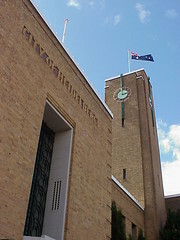 When the Melbourne suburb of Heidelberg was declared a city in 1934 two firms of architects, Leith & Bartlett and Peck & Kember, were appointed to design the Town Hall and Offices. 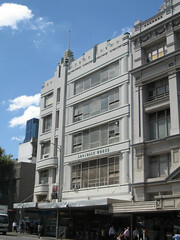 Building was completed by mid 1937. The austere complex is constructed in dark brick with little external decoration. It is reminiscent of the work of Dutch architect Willem Dudok, especially his design for the Hilversum Town Hall dating back to the mid 1920s. One concession to external decoration is the lettering of "City of Heidelberg" and "Town Hall" integrated into the brickwork. Other concessions include stepped back brickwork around doors and windows and the use of green neon on the tall square clock tower. 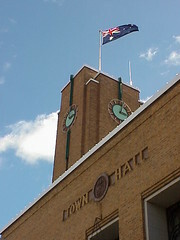 The clock tower provides much needed height to the otherwise squat rectangular mass of the buildings as well as advertising the new-found status of the City. Inside, the buildings are magnificent. Many of the original features remain intact including signage, built-in clocks and lighting. 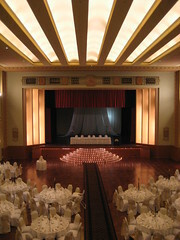 The Centre Ivanhoe is one of Melbourne’s best Art Deco buildings and hosted a Grand Ball when the Art Deco Society hosted the 9th World Congress on Art Deco in 2007. The photo at left shows the main room set up for a wedding. Ostend is a substantial block of flats by I G Anderson built in 1934-35. 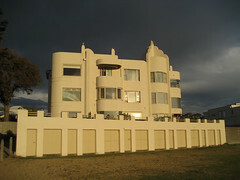 The building sits right on the foreshore in the Melbourne suburb of Brighton providing direct access to the beach. The white doors along the front wall are actually boatsheds and I like to think that at least some residents still house their boats there. 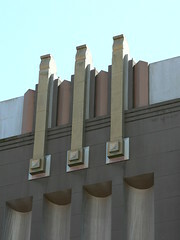 The complex façade is a series of art deco style setbacks. The left edge of the building is squared-off with a flat section broken by a strong vertical band leading to two interlocking semi-circles on the roofline. The rounded balconies marking the end of this section would all been open like the top one in the picture but like Arnold Court in South Yarra most of them have been enclosed. A somewhat plain section links the balconies with the most striking feature of the façade, a circular tower topped with finials which descend in curved steps from a small pagoda style cap. The ribbed finials continue down the front of the tower casting shadows that provide depth to the building’s seaside face. A second series of balconies complete the façade by curving around to the side of the building. All of these balconies have been enclosed, unfortunately using different window styles which detract slightly from the original beauty of the façade. It is still a great building though. Ostend has been repainted recently and looks great against a stormy sky. Arnold Court is another block of flats in the inner Melbourne suburb of South Yarra. Originally built in 1940, all the balconies would have been open like the top two in this picture. The block is symmetrical with curved balconies leading to the central stairway above the front entrance. The centre of the building is marked on the roofline by a concave point with similar concave diamond patterns displayed in the render. A series of steps also draw the eye to the buildings apex while a horizontal band from each step turn into a vertical band leading back to the main entrance. Three bold horizontal provide simple decoration for each of the balconies. 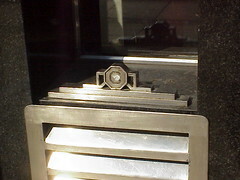 This photo shows the decorative grills on the windows above the front entrance. The door has a similar grill. They seem to have a French influence to me, much like the door of nearby Abercarn flats. The name and street number are proudly displayed in relief ironwork above the doorway, another common deco feature. 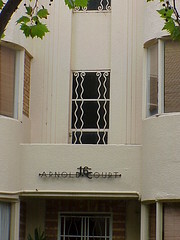 Arnold Court is typical of art deco flats in Melbourne. 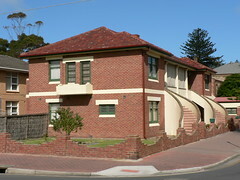 They tend to be three storeys tall because the planning laws at the time dictated that any higher required a lift so three storey walk-up flats are very, very common in the Melbourne suburbs. This fantastic Art Deco door belongs to a block of flats in South Yarra, a suburb of Melbourne, Australia. The name Abercarn is nicely worked into the design of the door, sitting on top of a series of frozen fountains, decreasing in size as you move down the door. I love that the paint is worn off at the bottom of the right-hand door. Purists might want a pristine paint finish but, to me, it shows that the building is lived in and the old door might sometimes stick and need a bit of persuasion with a well placed foot. In the early 1920s, Imperial Prince Asaka Yasuhiko left his home in Japan to undertake military studies in France. After a car accident in Paris, his wife Princess Nobuko joined him and together they developed an interest in Art Deco. They both attended the Exposition Internationale des Art Decoratifs et Industriels Moderne in Paris in July 1925. A few years after returning to Tokyo, Prince Asaka had a residence built for his family. It was completed in 1933 to plans from the Design & Construction Section of the Ministry of Imperial Household. It is a great looking building to come from such a stuffy sounding organisation. The interior was largely designed by Frenchman Henri Rapin but one of the highlights is the front entrance featuring four frosted glass panels by the Rene Lalique. The panels are every bit as beautiful as any of Lalique’s delicate vases. 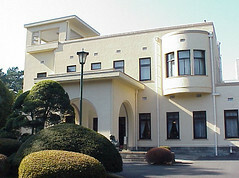 The building now houses the Tokyo Metropolitan Teien Art Museum which allows the public to view the house and grounds as well as the current exhibitions. I stuck it lucky when I visited the Museum since there was an Art Deco exhibition on at the time. I don’t remember much detail of the exhibits since they were labelled in Japanese but that’s OK I can appreciate things for their style alone. I don’t need to know everything about an object. 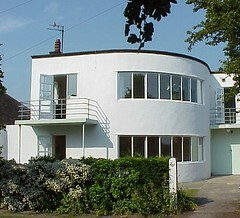 In 1933-34 British Architect Oliver Hill designed an estate in the Essex town of Frinton-on-Sea. 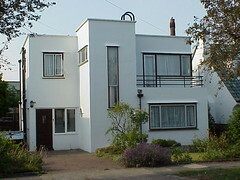 The Frinton Park Estate was only partially realised but there were enough Art Deco and modernist houses built to get a feeling for how Hill planned the estate to look. The first building to be completed was The Round House (above). Designed by Hill, it was used as the estate office and featured a mosaic of the estate layout on the floor designed by Clifford Ellis. 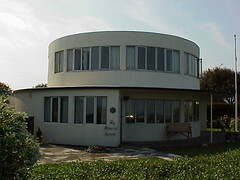 The Round House has since been converted into a residence. The house pictured right was possibly designed by Hill also. It demonstrates how streamline curves were used in conjunction with rectangular elements to create a pleasing overall design. 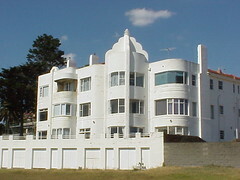 Balconies, large windows (for 1930s England) and French Doors emphasis the seaside location. Several architects worked on designs for the estate. 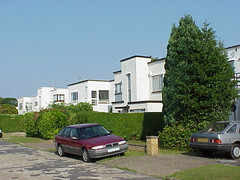 The house shown on the left was probably designed by local Frinton architect JT Shelton who designed many houses in the area. This house is very different to the other example but expresses a lovely asymmetrical face. The windows on the right cut through the corner and the three small vertical windows beside the door echo the larger configuration above the door. It even includes a car garage, although it looks very narrow to me. I doubt if a modern car would fit through the doors. 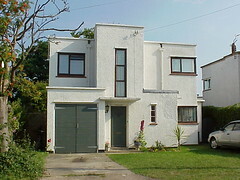 Frinton-on-Sea is great place to explore, especially if you want to check out some British White Modernist Houses. 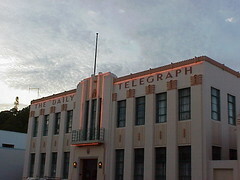 The Daily Telegraph Building was built in 1932 to designs by architect E A Williams. It is a symmetrical two storey building with a central section sporting a small balcony and topped with a flagpole. The balcony has an iron balustrade with a geometric pattern which reminds me of some of the decoration on the Hoover Building in west London. The rest of the building is beautifully decorated. Columns between each window are crowned with a complex arrangement of curves and arches separated from the smooth render of the columns by a zig-zag band. A repeating pattern of short vertical blocks are separated with larger blocks at regular intervals. The name of the newspaper which occupies the building is spelt out in large letters across the whole façade. The decoration continues inside around the cornice of the main rooms and at the top of the internal supporting columns and interior lights. 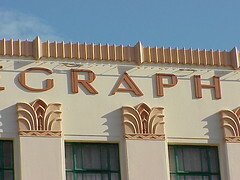 The Daily Telegraph Building is a great Art Deco building and one of the highlights of Napier, New Zealand’s Art Deco city. One of the things about Art Deco around the world it that local flora, fauna and indigenous art were often incorporated into the contemporary designs. So there are Maori decoration in New Zealand, baboons and elephants in South Africa and kangaroos in Australia. 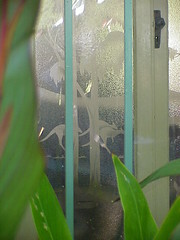 These etched glass doors are in a block of flats in Melbourne. They portray a troop of kangaroos hopping amongst the eucalypts. It is a uniquely Australian scene and could only appear in Australia. I’ve seen elephants on Art Deco buildings in Ireland and England which seems all right there even though obviously elephants are not native to that part of the world but I can’t imagine any of Australia’s native fauna being used anywhere else. I found a few Art Deco cinemas in Adelaide but I think the Piccadilly in O’Connell Street, North Adelaide was my favourite. 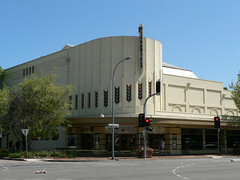 The Piccadilly Theatre was built in 1940 to designs from Adelaide architects Evans, Bruer and Hall with Guy Crick and Bruce Furse from Sydney. Except for the circular tower above the main entrance, the cinema is not that spectacular on the outside. 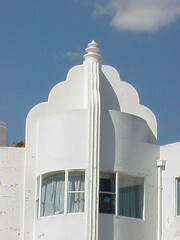 The main decoration coming from the large fin bearing the cinema’s name and the chevron shaped windows progressing around the tower. Come inside and see what those same chevron windows do when a bit of sunlight comes through. The light is magical bringing the upper foyer to life. There are several other circular or semi-circular windows that are very nice as well as simple wall lights and elaborate spiral banister rails which add to the charm. I’m not sure how many cinemas have been placed into the Piccadilly but it is nice to see these older cinemas like the Sun Theatre in Yarraville still being used and allowing people to celebrate going to the picture in a lovely building rather than the style-less mall multiplexes which could be anywhere … Los Angeles, Glasgow, Geelong, Chadstone … everywhere the same generic design. Anyway that’s enough venting. If you have a nice old cinema in your neighbourhood make the effort to go there rather than driving down to the shopping centre or mall. Bestow your patronage on the things that make your town unique. It’s the best way for them to survive and thrive. Then when other places have lost all their charms, people will travel to see what you have preserved. New York City is rich with Art Deco skyscrapers and the McGraw-Hill building in West 42nd Street is a beauty. 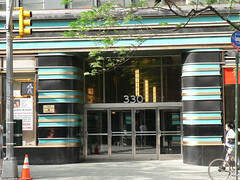 McGraw-Hill moved out in the 1970s and their name which was in a striking deco font was removed from above the door. McGraw-Hill is still on top of the building although it is somewhat compromised by the air-conditioner units sitting right next to it. There are three units on each side of the building so I guess they keep the symmetrical deco styling. 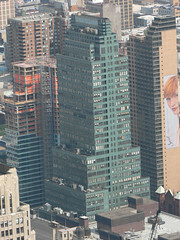 I quite like my photo taken from the Empire State Building (click on it to view a larger version). The green giant really stands out against the less colourful surrounding buildings. But if you want to see colour, you just need to look at the entrance on 42nd Street. Bold aqua and gold bands set in a black surround. Sounds a bit much when you read it but look at the result in the picture. Stunning! The curved wall of the entrance work with the banding to draw you into the building. The McGraw-Hill building may not be up there with the Theatres of 42nd Street but it is worth dragging yourself away from the bright lights of Times Square to venture across 8th Avenue, past the Port Authority Bus Terminal to check it out.